Hi There! Welcome to our Club! Sending healthy and positive thoughts to President Pam! Roast of John Laird - Fundraiser benefiting Second Harvest Food Bank and other local charities. - April 26th. Sign up online under events on our website or Second Harvest's website. We are still looking for Sponsors and silent auction items. Our live auction looks fantastic! We will be having our major fundraiser April 26th to benefit Second Harvest. It will be a roast of John Laird. It should be very entertaining. Save the date and plan to attend. Our Polio Plus campaign begins on the first of March and runs thru April 30th. The goal is for every Rotarian to donate $50. This will be matched on a 2:1 basis by the Gates foundation. April 6th is the district training assembly from 8-2 at the Biltmore hotel in Santa Clara. See Doug for more information. April 14th is the Lacy J. Dalton concert at Roaring Camp in Felton. It begins at 1:00 and ends at 5:00. Tickets will be available on line thru the Scotts Valley Rotary website. There is a rumor that if come you will see our own Thomasjohn on the bass!! The club has changed the schedule for our community grants awards this year. We will delay the grant awards until fall of 2019 so that we can determine the exact amount of funds we have to distribute. Watch this site for more information. Wed Feb 20th from 4:00 to 7:00 will be Aptos area Chamber of Commerce Business Showcase. We will have a booth there. If you signed up to help, please be there. April 6th is the district training assembly from 8-2 at the Biltmore hotel in Santa Clara. See Pam for more information. The Area 7 speech contest will be Mar 6th at SLV high school at 3:30 in the afternoon. Come and support our winner Holden Barker! Mar 15th is Rotary Day at the Warriors. A link will be posted on the Santa Cruz Rotary website for ticket purchase. .
Today was our area speech contest. Participants included: from Soquel High School Annie Nigh, Sophie Nigh, Stuart Morse, Maddie Piona, Roxie Harris, Aliya Ware, and Stella Gordon and from Aptos High: Emily Marschall Niswonger and Holden Barker. The winners were: third place ($50) Maddy Piona, second place $(100) Annie Nye and first place ($200) Holden Barker.Congratulations to all participants for a job well done! Michelle reminded us that we will be having our major fundraiser April 26th. It will be a roast of John Laird. It should be very entertaining. February 14th will be the speech contest for high school seniors in the area. ] Please come early that day, no later than noon. We may have as many as 10 contestants so we will need every minute! If you are a volunteer, come a bit earlier. There will also be a board meeting on the 14th. Because of the speech contest it will begin at 10:30 and end promptly at 11:30. Wed Feb 20th from 4:00 to 7:00 will be Aptos area Chamber of Commerce Business Showcase. We will have a booth there. You can sign up to help with Doug Deaver. 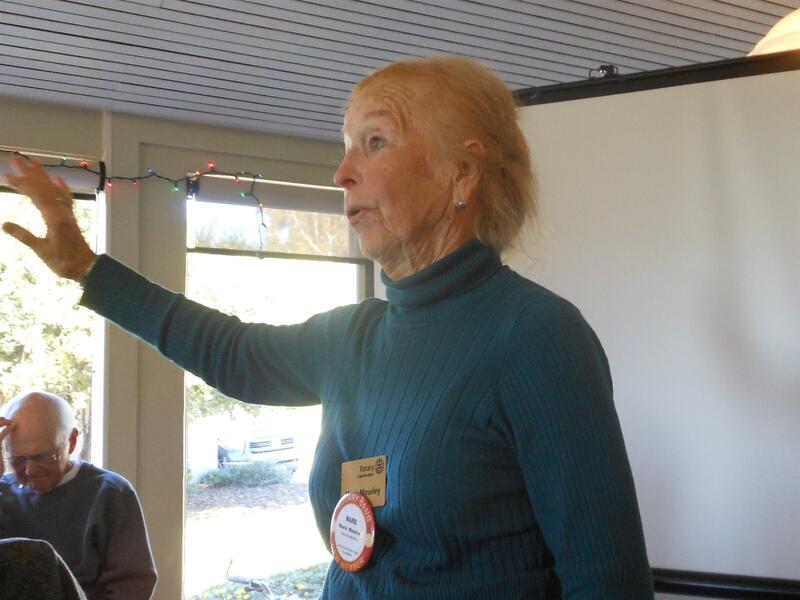 Our speaker today was Peggy Pollard who spoke to us about the Rotary safari to Kasese Uganda. It is part of a Rotary Global Grant for clean water. The trip is planned to be this April from the 1st – 15th. February 14th will be the speech contest for high school seniors in the area. Save the date! Doug will send around a sign-up sheet to assist. There will be a meeting of the club foundation on Jan 31st at 11:00. That same day there will also be a meting of the community grant committee at 10:00 AM. All are welcome to come. Our speaker today was Nima Jafarian. He is the co-founder of ACI research labs. He has over 10 years of experience in R and D and multiple graduate degrees. He spoke today about a new method of cognitive assessment that he has developed recently that can be accessed by your cell phone. The Aptos Times will be doing an article on RotaCare. Look for it! 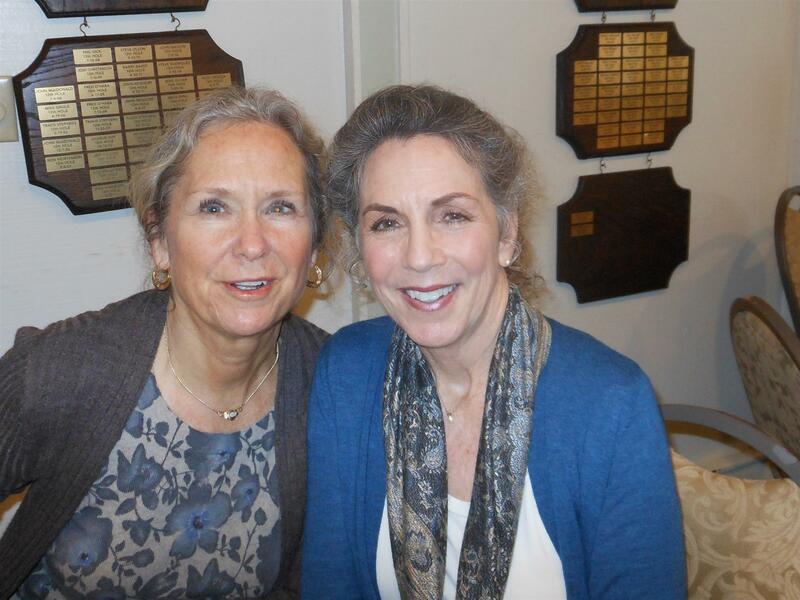 Margaret Putnam-Pite, LCSW was our speaker today (pictured at right above). She has spent many years in the field of palliative care (which includes hospice) and has now opened a private practice in this field. The goal of her practice is improving quality of life for those affected by a life-threatening illness. Today was Keith’s 93 birthday! We wish him a lovely day! February 14th will be the speech contest for high school seniors in the area. Save the date! 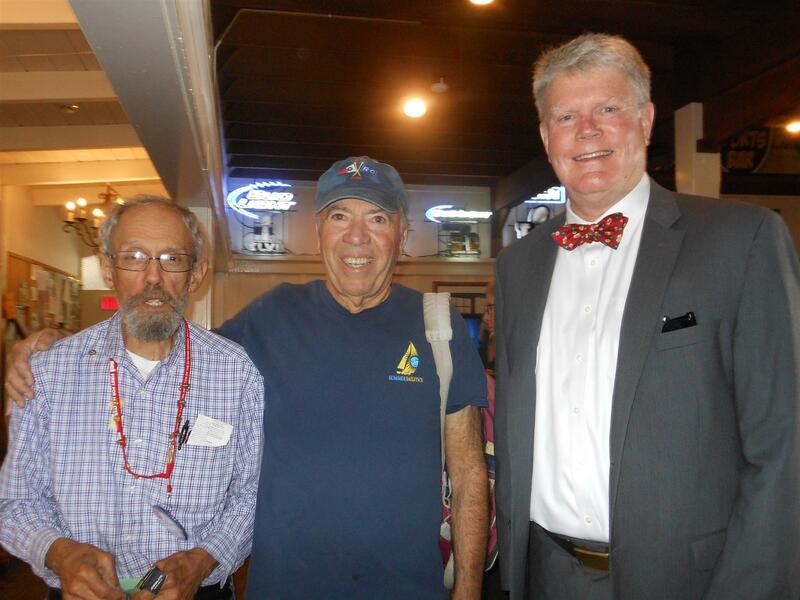 Today’s speaker was Lew Jennings (on the right above) author of 19 minutes to live: Helicopter combat in Vietnam, a memoir of his years there. The title refers to the average time to live for a helicopter pilot in the worst days of the war. Lew flew over 700 combat missions. He gave us a review of the use of helicopters in warfare as well gripping stories of life on the battlefield. Next week there will be a board meeting at 11:00. Among other items we will be discussing community grants and the fundraiser. Michelle announced that we will be having our major fundraiser April 26th. It will be a roast of John Laird. It should be very entertaining. Our speaker today, Rick Bar, (pictured above with past president Pam Goodman) is the area director for account management from Kaiser Permanente. 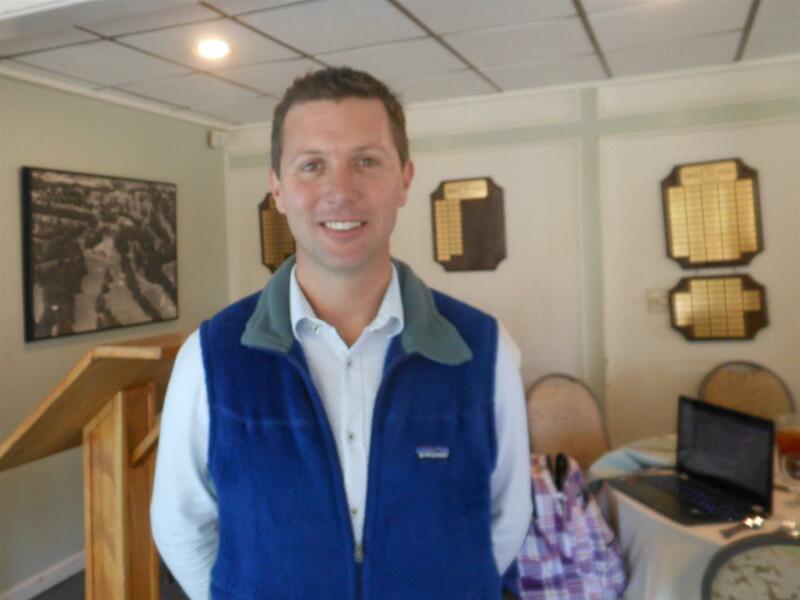 He has several advanced degrees including one in international business administration and is on the board of directors of the Aptos Chamber of Commerce. Dr. Art announced we will have another weed pulling day. He will send out details in e-mail. Craig Matthews today received his blue badge. William Gray received his Paul Harris-plus-Four pin today. Congratulations Bill! We received our DDF award today! Approximately half of the money will go to Rotacare and half to Rising International. This is a cooperative project and you will hear more about our contributions of time and labor in the future. Next week (December 27th) is dark! See you in two weeks (Jan 3rd). Happy holidays to all! Carmel Judd spoke to us today about Rising International (on the right above with supportive club member Kendra Cleary). It began 20 years ago focusing internationally on human trafficking , then tackled human trafficking here in our own community. Remember your Rotary Foundation pledges are due! You can pay up till December 15th. See John Fisher. Dr. Art announced we will have another weed pulling day. He will send out details. The regularly scheduled board meeting is cancelled next week, December 13th . We will meet as usual on the second Thursday in January. Edward Jones. He has one son and loves golf! photography and is learning to play the ukulele. Dave has lived pretty much his whole life in the bay area. He is a transfer from the Los Altos club. daughters and granddaughters and enjoys water sports. Keith reminded us that the annual Christmas party will be December 2nd at his house at 4:00. Remember your Rotary Foundation pledges are due in November but you can pay up till December 15th. See John Fisher. Taylor Brevis from Congressman Panetta’s office gave us a legislative update. She said the Congressman is focused on the farm bill. She also spoke about his focus on the need to have a budget and not a government shutdown. In the new session, they will renew the voting rights act. The first piece of legislation will be on conflict of interest laws. It will focus on reining in dark money in politics. Other issues to be addressed in the new session will be lowering prescription drug prices, immigration reform and environmental protection. We had two red badge speakers today. The first was Trish Glassey. She was born in Hawaii then moved to California. She did undergraduate work at UCSC and graduate work at Univ of Michigan and worked in politics and program analysis for many years, among them as an aide for Leon Panetta! Welcome Trish! Matt Wetstein , our second red badger, also worked in politics as an aide for Paul Simon. His dissertation was on abortion politics in the U.S and it turned into a book on abortion rates in the U.S., one of the first studies to look at all fifty states. He is in his ninth month as President of Cabrillo College and loves it and loves being here. Welcome Matt! Keith announced that the annual Christmas party will be December 2nd at his house at 4:00. Please sign up and indicate how many of you are coming. Kate announced that the symphony league’s big fundraiser home tour will be December 1st and 2nd. See her for tickets…. Next Thursday is the Foundation Board Meeting at 11:00. Remember your Rotary Foundation pledges are due in November. See John Fisher to pay. Next Thursday November 15th there is a fundraiser for Rising International at the tech museum in San Jose. A special price for Rotarians has been set at $125. If you wish to go see Pam or Doug. 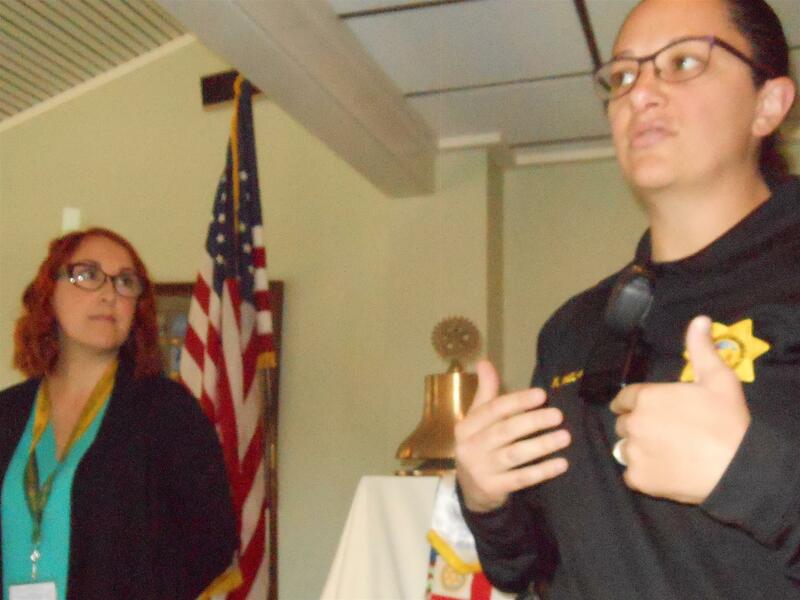 Our speakers today were Cynthia Chase and Sgt. 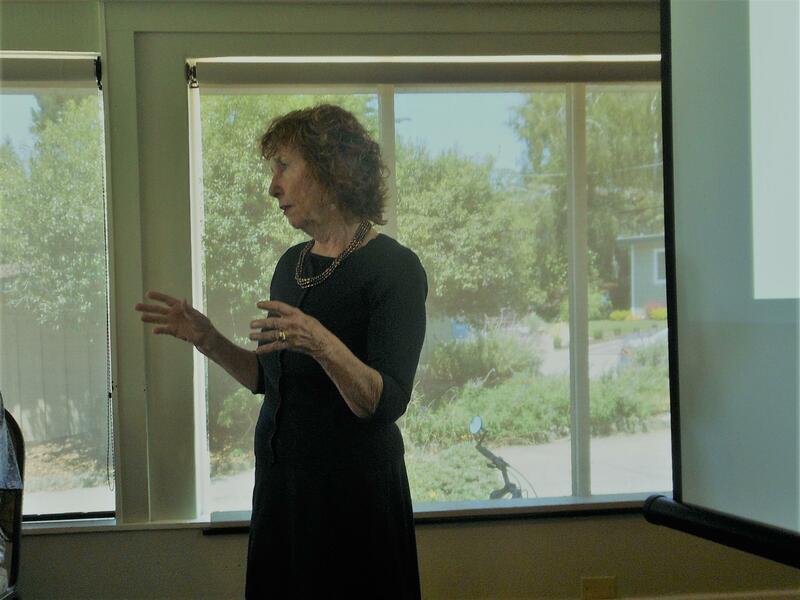 Karen Wells from the re-entry and rehabilitation Rountree facility in Watsonville. The new facility was opened in July of this year. The facility is funded by AB 109 and SB 1022 for “prison realignment”. Keith announced that the annual Christmas party will be December 2nd at his house at 4:00. Please sign up on the sign-up sheet and indicate how many in your party. 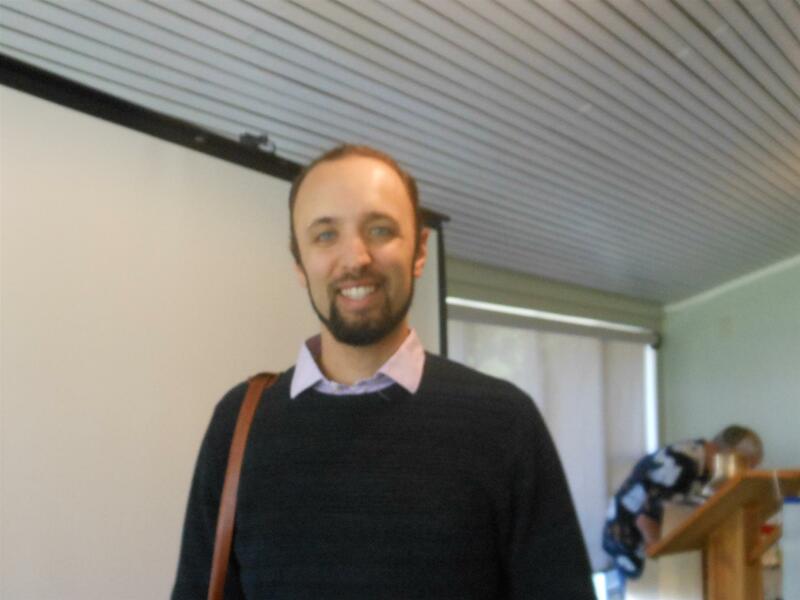 Sandy introduced our Piatt fellow from UCSC, Alexey Munishkin. He is a post grad student in the field of electrical and computer engineering department. He is studying programming related to robotics and automation and how to incorporate safety and time efficiency into areas such as air traffic control and automotive guidance systems. Remember next week is dark for Thanksgiving! Chris Figureida was here today to speak about Cycle for the Heart, a program of Heluna Health, part of the American Heart Association. He described for us his first cross country ride. This Saturday November 3rd the club will be doing weeding at the The Farm Park in Soquel, a project for the restoration of Native Plants. The park is up from Soquel Drive (near Fairway). Go north on Harden, then to the right on Tee. This will replace our usual beach clean-up. There is a club board meeting on November 8th at 11:00. All are welcome. 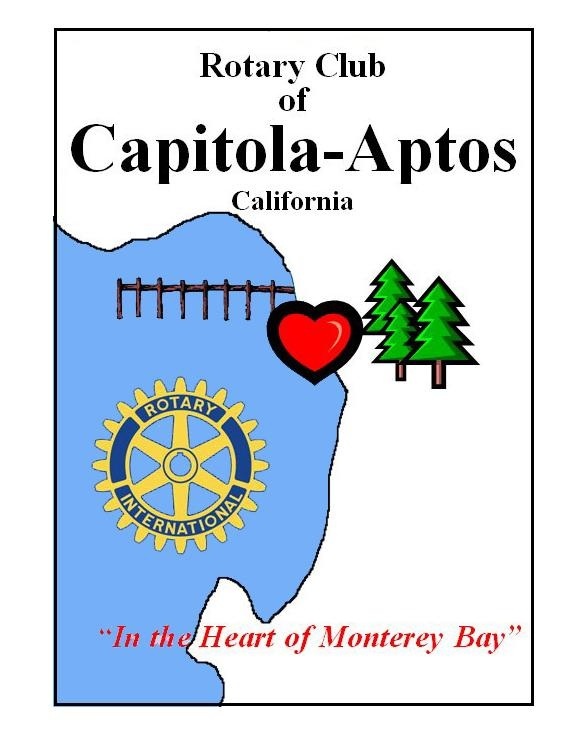 We will be hearing a presentation about the Capitola library. Keith announced that the annual Christmas party will be December 2nd at his house. Please sign up on the sign-up sheet and indicate how many you of you are coming. Kate announced that the home tour will be December 1st and 2nd for th symphony league’s big fundraiser. See her for tickets…. Today our club heard a presentation from two political science professors from Cabrillo College. Cabrillo President Matt Wetstein introduced Rory 0’Brien and Nick Rowell from the Department of Political Sciences. Dr. O’Brien focuses on forces in American politics and served two terms as faculty president. Dr. Rowell teaches courses on comparative government and has a research focus on Latin American politics. We will be doing weeding at the The Farm Park in Soquel, a project for the restoration of Native Plants. The park is up from Soquel Drive (near Fairway). Go north on Harden, then to the right on Tee. It will be Saturday November 3 at 9:00 AM. This will replace our usual beach clean-up. 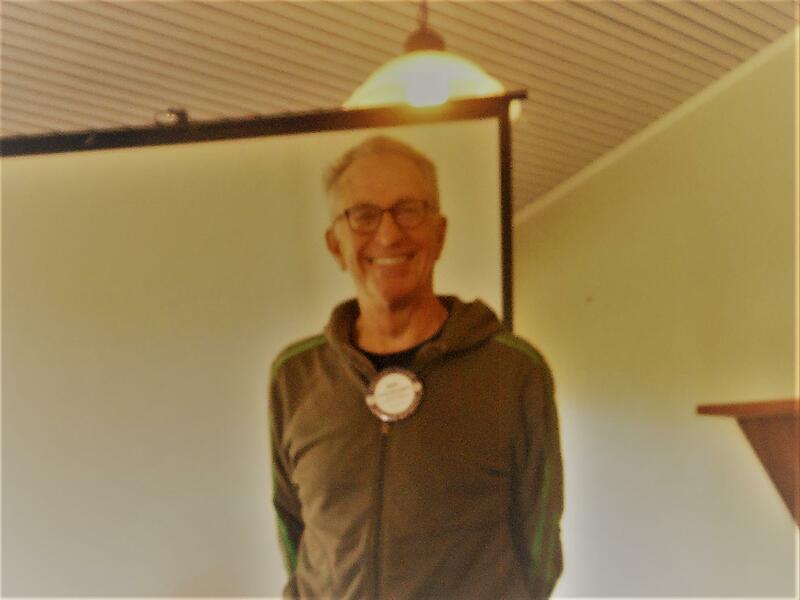 Today the club was welcomed at the Seaside company where Wes Walker gave us a presentation about the Seaside company and the security division and the Santa Cruz Beach Boardwalk. The dedication for Leo’s Haven will be Oct 13th. The address is 1975 Chanticleer Ave and the festivities will take place from 10:00 to 2:00. If you signed up to help set up please arrive by 8:30. We will be doing weeding at the The Farm Park in Soquel, a project for the restoration of Native Plants. The park is up from Soquel Drive (near Fairway): north on Harden, then to the right on Tee. It will be Saturday November 3 at 9:00 AM. This will replace our usual beach clean-up. Friday Oct 26th will be the date for the dinner honoring our own Michelle Bassi, this year’s Woman of the Year. Make checks out to Aptos Seascape for $85 and give them to Doug to reserve our table. 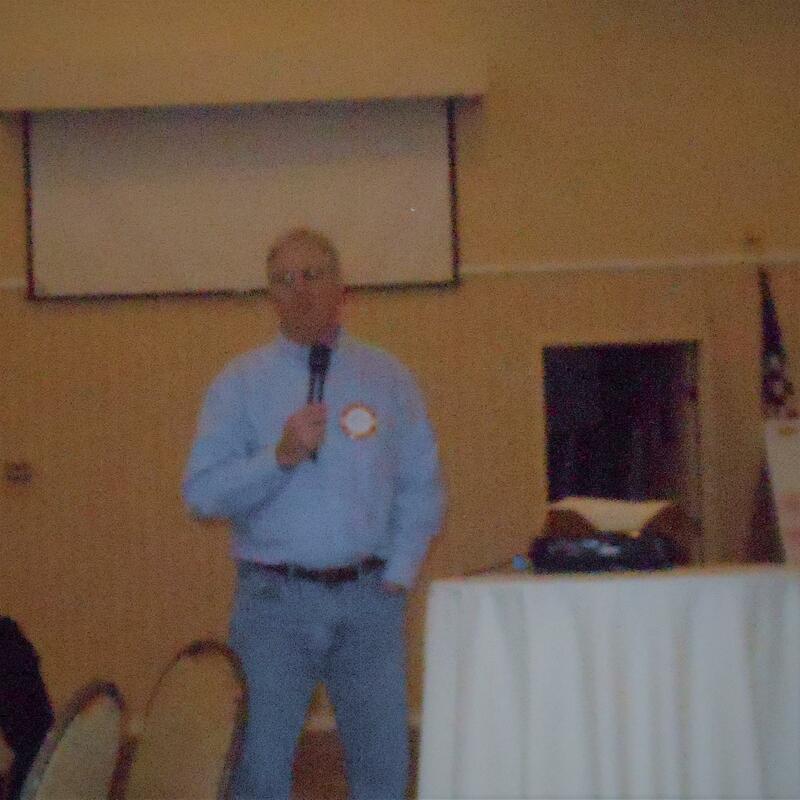 Our district governor Tim Lundell was our speaker today. He was born and raised in Portland, Oregon, and came to California in 1972 to attend law school at Santa Clara University, and to start a law practice which continues today. The District Governor’s visit is scheduled for Oct 11th. We will meet in the big room that day. 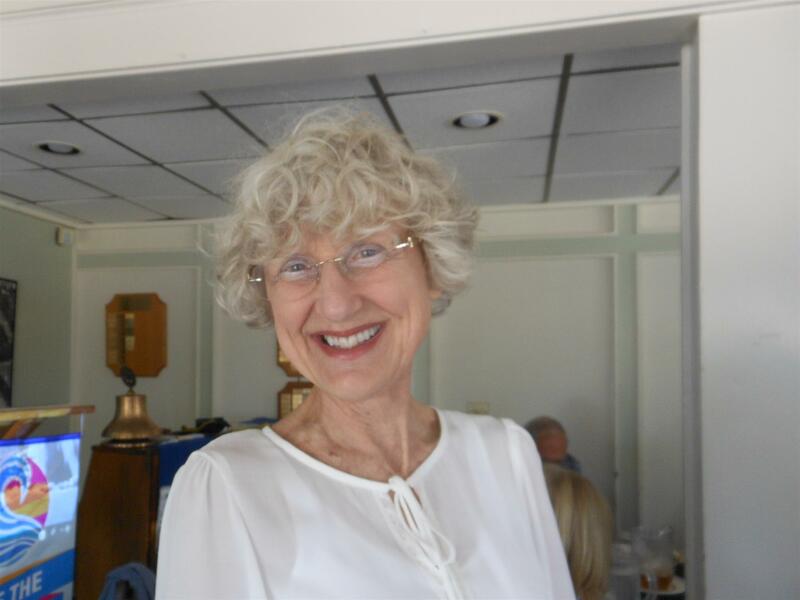 Sandie will be honored by the Volunteer Center for a "Be the Difference" award at a luncheon at the Coconut Grove on Wed, Oct 24, 11:30. If interested in going see Pam. 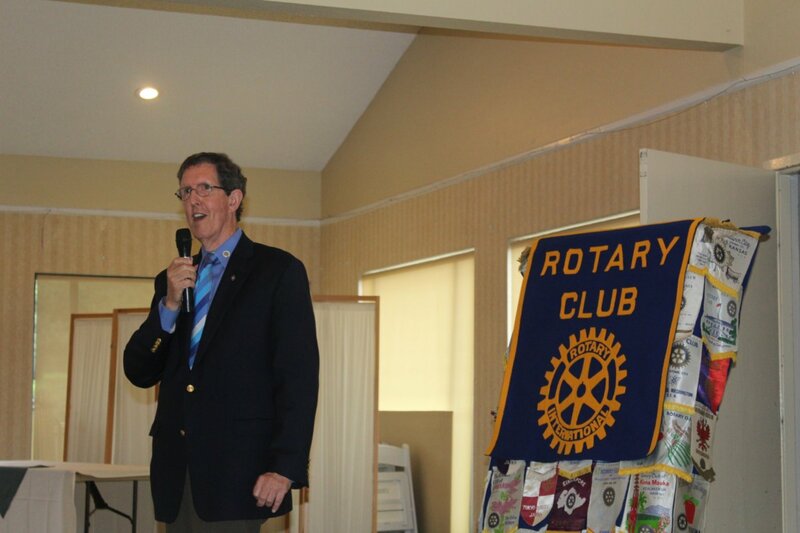 Remember to turn in your Rotary Foundation Pledge Cards to John Fisher in the next two weeks! We would like to have them turned in before the district governors visit! Peggy Townsend was our speaker today. She writes for UCSC and is a former Sentinel journalist. She is currently a mystery writer and spoke to us today about her career transition. The title of her first book is See Her Run. We will be doing weeding at the The Farm Park in Soquel, a project for the restoration of native plants. The park is up from Soquel Drive ,north on Harden, right on Tee. It will be Saturday November 3 at 9:00 AM. This will replace our usual beach clean-up. Avenues of Service will be on Oct 4th from 4:00-9:00. The club will pay the fee of $49.50 if you wish to go. See Pam for more information. Dr. Art will be bringing flu vaccine the next few weeks for those both over and under 65. Sept 29th will be the Freedom and Watsonville Rotary Clubs Burrito Bash at the Santa Cruz Fairgrounds. There will be great food and entertainment. Go and support our neighbor clubs! Remember to turn in your Rotary Foundation Pledge Cards to John Fisher in the next two weeks! We would like to have them turned in before the district governor's visit! 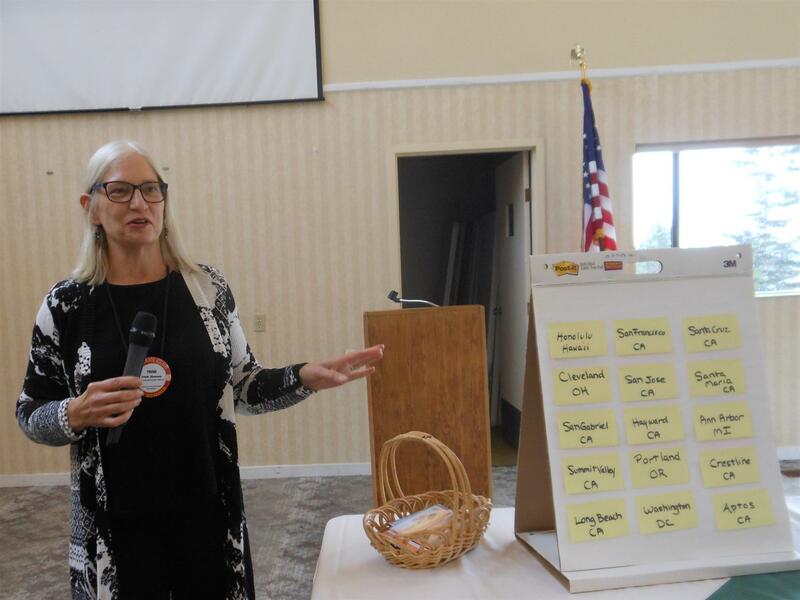 Cindy Jackson spoke to us today about the state of the libraries. 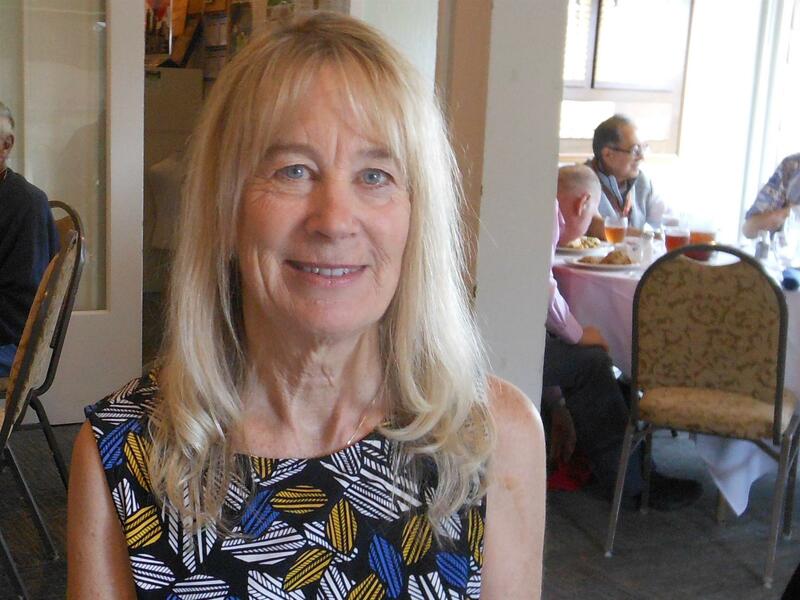 She is on the Friends of the Library board at the La Selva Beach branch . Dr Art will be bringing flu vaccine the next few weeks for those both over and under 65. 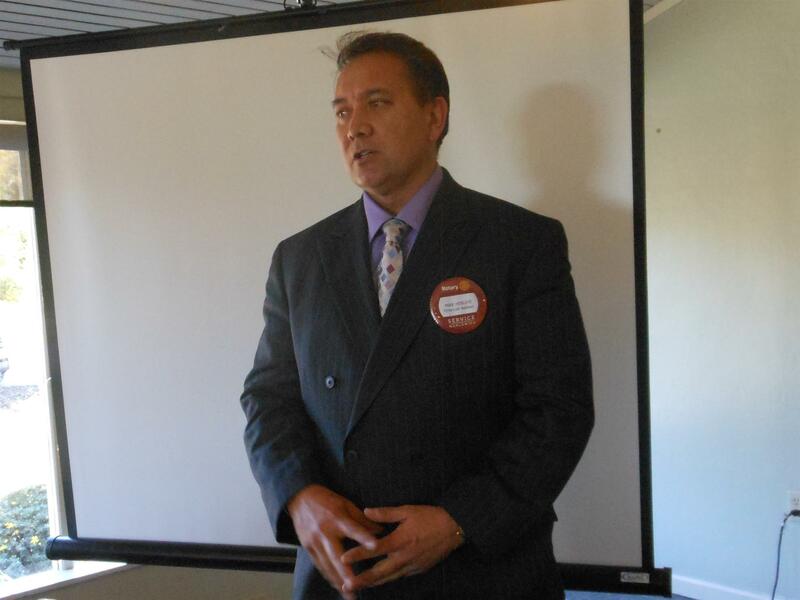 Remember to turn in your Rotary Foundation Pledge Cards to John Fisher in the next two weeks! We would like to have them turned in before the district governor's visit. 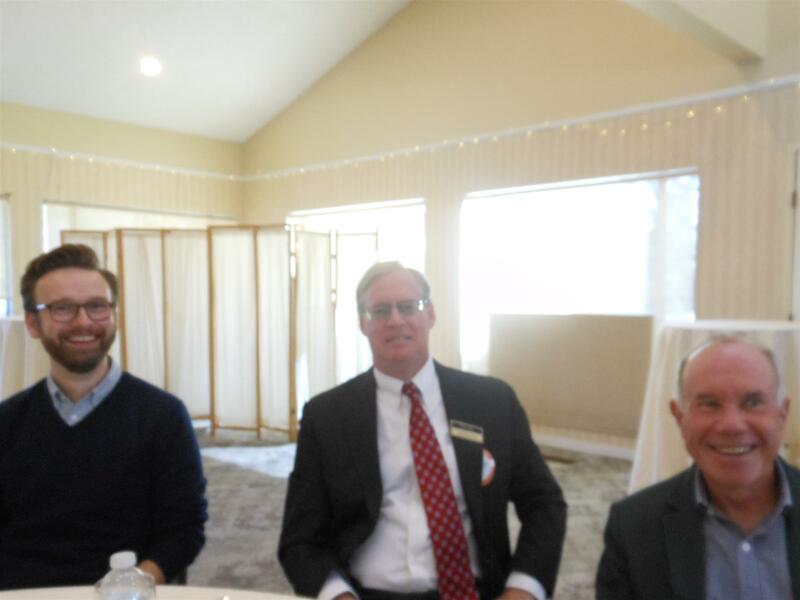 Assemblyman Mark Stone, the assemblyman for District 29 which includes Santa Cruz Count was our speaker today (On the right in photo above). He is in his third term. He is the chair of the judiciary committee and on several other committees including banking and finance. Come and participate in the Sunrise rotary bike ride event for Leo’s Haven on Saturday Sept 29th or help with clean-up the week before the dedication on October 13th. Clean-up day will be Saturday October 6th. Dr Art will be bringing flu vaccine the next few week for those both over and under 65. Come and participate in the Sunrise rotary bike ride event for Leo’s Haven on Saturday Sept 29th or help with clean-up the week before the dedication on October 13th. Sign up with Doug. More details later. Friday Oct 26th will be the date for the dinner honoring our own Michelle Bassi, this year’s Woman of the Year. Save the date! Dr Art will be bringing flu vaccine next week for those both over and under 65. 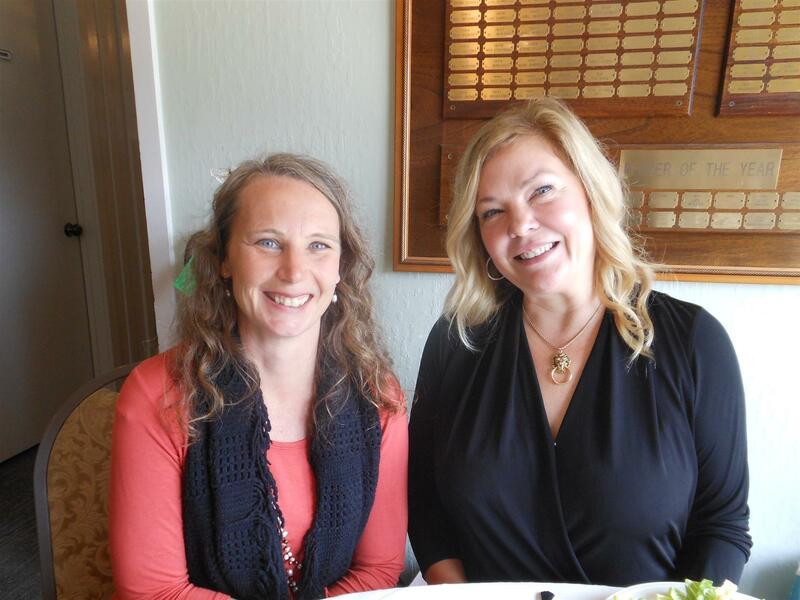 Dr. Julie Macecevic from the Walnut Ave Family and Women’s Center was our speaker today (pictured above with Anissa Novak). Julie is a clinical psychologist who has had years of counseling experience with women and youth. 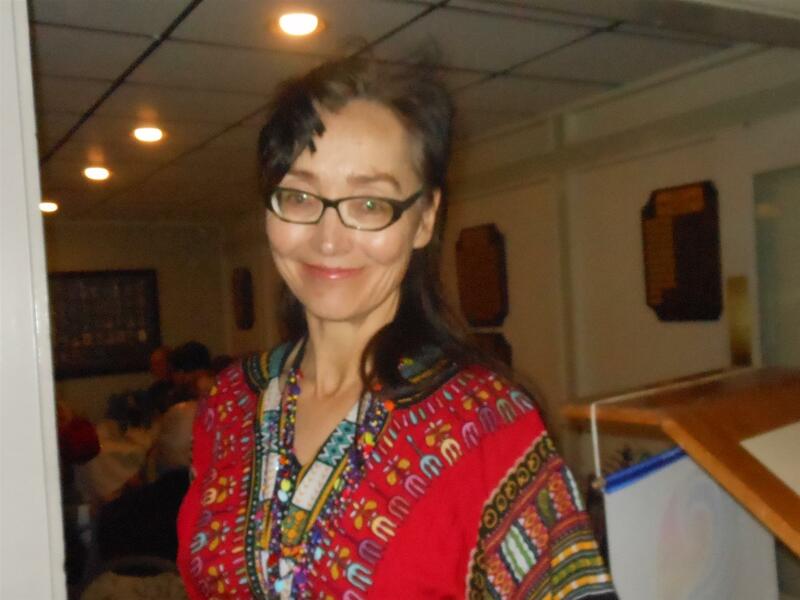 She spent 27 months as a peace corps volunteer in Morocco. Keith’s annual summer party will be Sunday August 26th at 3:00. There will be games and refreshments. Bring your favorite hors d’oeuvre to share if you wish! Save Aug 30th for Win’s debunking. It will begin around 5:30 at Santa Cruz Yacht Club. Cost is $40 at the door. Please note: The club itself will be dark that day. Come and participate in the sunrise rotary bike ride event for Leo’s Haven on Saturday Sept 29th or help with clean-up the week before the dedication on October 13th. See Doug for more details. There will be an Area 7 Rotary mixer will be on Oct 9th from 5:00-7:00. There is a $5.00 fee for hors d’oeuvre and drinks. 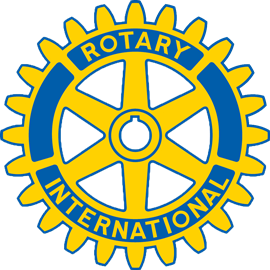 This event is just for Rotary members to get to know each other in our area. Kent benedict spoke to us about a scholarship fund set up in the name of our dearly missed Dr. Stan Hajduk. To donate go to keck.usc.edu/giving/classof1968. Friday Oct 26th will be the dinner for our own Michelle Bassi, this year’s woman of the year. Save the date! Dian Corneliussen from Metavivor came to speak to us today about creating awareness for metastatic breast cancer. She is a local person who retired from the air force, after working on cases of people who did not return from Vietnam. Keith’s annual summer party will be Sunday August 26th at 3:00. There will be games and refreshments. Bring your favorite to share if you wish! Save Aug 30th for Win’s debunking. It will begin around 5:00 at Santa Cruz Yacht Club. Note: The club itself will be dark that day. Saturday August 18th Cabrillo Stage has set aside seats for The Producers for SIRS and CAP Rotary for the 2pm matinee. If you are interested in joining us tickets are $40 each and can be ordered by calling Cabrillo Stage at (831) 479-6154. Saturday August 25th the Derby Girls will be playing at the Santa Cruz City Auditorium at 6:45pm. General Admission tickets are $17 each and they will help coordinate a section for us. Call the box office at 831-420-5260. Come and participate in the sunrise rotary bike ride event for Leo’s Haven on Saturday Sept 29th. They need our help with volunteers or you can ride and raise money. See Doug for more details. 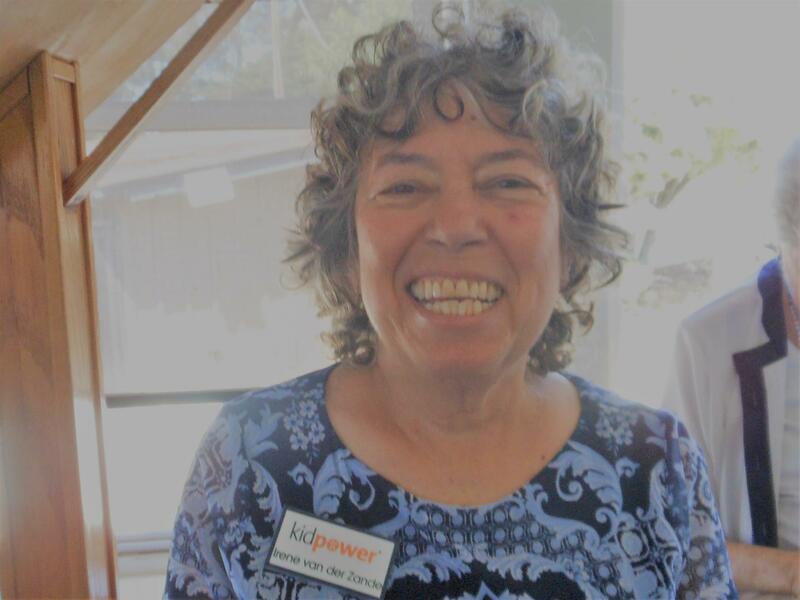 Our speaker today was Irene Van Der Zande from Kidpower, a non-profit which focuses on personal safety for kids, teens adults and seniors. Our incoming president Michelle Bassi and our Rotacare MD Dr Chandra are both on the ballot for people of the year. Please vote! The voting deadline is Aug 13th at 5:00 PM and you can vote on a paper ballot or electronically at www.aptoschamber.com. Save Aug 30th for Win’s debunking. It will begin around 5:30 at Santa Cruz Yacht Club. Becky Peters announced the annual memory walk to benefit Alzheimer’s Association will be Sept 22nd at Seascape Park. If you want to walk with our team, sign up with Becky or you can simply donate any amount. Today our own Sandy and Doug spoke to us about the RYLA experience. They covered the history of the Rotary Youth Leadership Award, which emphasizes learning leadership qualities and skills. It began in 1959 in Australia. The first year in our district was 1983 and we have gone on from there. It now costs about $600 for each student and we are allowed to send 4 kids per year; two from Soquel High and two from Aptos High. The next will be a board meeting at 11:00 next Thursday (Aug 9th) at Aptos Seascape. All members are welcome to attend. Our incoming president Michelle Bassi and our Rotacare MD Dr. Chandra are both on the ballot for people of the year. Please vote! The voting deadline is Aug 13th at 5:00 PM and you can vote on a paper ballot or electronically www.aptos chamber.com. Walnut Ave Women’s Center gave us a sponsorship ticket for their fundraising brunch on Sunday Aug 12th. Let Pam or Michelle know if you wish to go. Saturday August 25th the Derby Girls will be playing at the Santa Cruz City Auditorium at 6:45pm. General Admission ticket ($17 each) and they will help coordinate a section for us. call the box office at 831-420-5260). 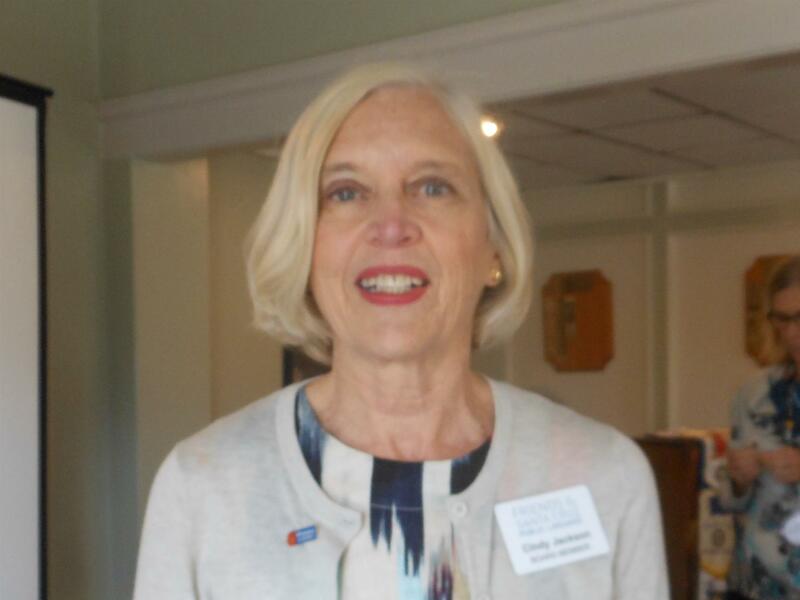 Our speaker today was Cathy Cress, MSW. 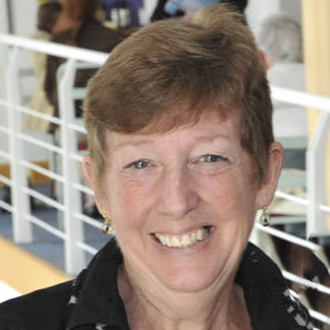 A graduate of UC Berkeley, she is an author and editor of the Handbook of Geriatric Care Management. She spoke today about the quality of life and bringing back joy as we age. Morning Larks and Night Owls :differences in the human circadian rhythm.